As a photographer it is hard to choose a “favorite” image. Personally I have hundreds. I was sad to read this was the last installment of the weekly wordpress photo challenge. I have enjoyed seeing so many amazing photos and reading people’s interpretations each week. I chose this image because whenever I look at it I feel and see so much! My husband and went to India for the first time in January of 2016. 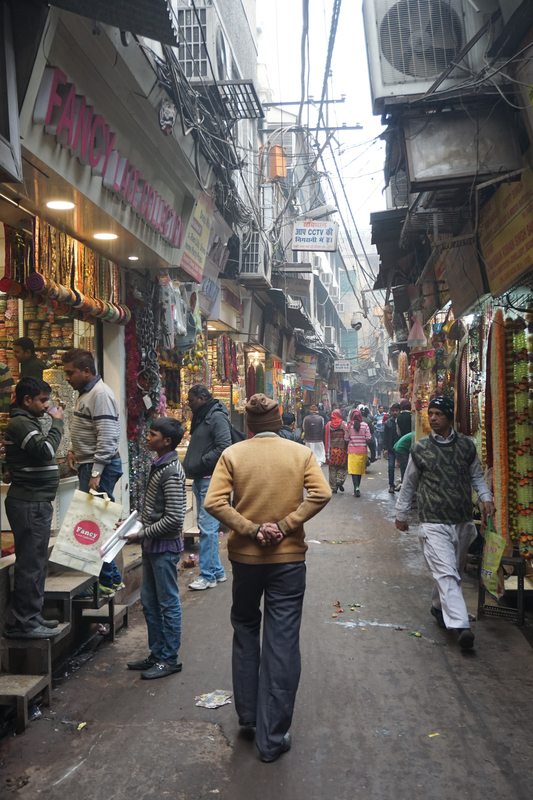 This photo, shot in Old Delhi, tells a story. I see this man in a walking meditation, peaceful and contemplative, perhaps deep in thought or maybe without! But even from behind he seems so at ease and at peace. Around him, the sights and sounds and smells of an old and dirty street. People doing business, selling and shopping, people on the move making their way to and from a destination. If you dive in and look around the grey-brown dirty street and buildings you catch beautiful colors poking out of shops. The colors of India! This entry was posted in daily prompt, Photography, Reflections and tagged lea austen photography, photo, photo challenge. Bookmark the permalink.